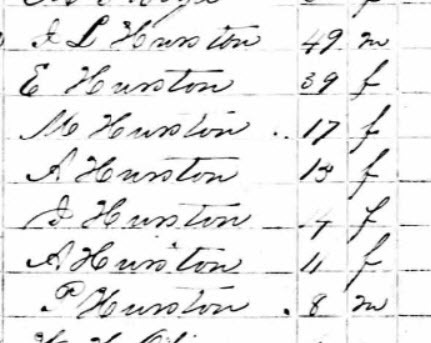 NOTE* There were two men named John Hairston born about 1811 in South Carolina. 1. John L. Hairston (1367), born to Robert and Sara (Lang) Hairston. He married Serena Thompson. John appears in Alabama in 1850, 1860, 1870, 1880 and lives in Alabama until he dies in 1890. [S3429] Texas Voter Registration 1867-1869, 1867 Voter Registration Lists. Microfilm, 12 rolls. Texas State Library and Archives Commission, Austin, Texas., Ancestry.com. [S3431] Texas, County Tax Rolls, 1837-1910", database with images, FamilySearch, Family History Library, Salt Lake City, Utah.